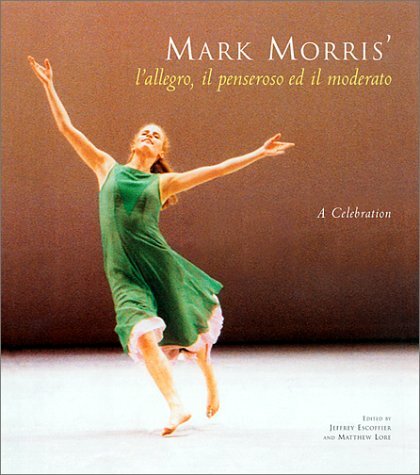 In Los Angeles, tonight through Sunday: The Mark Morris Dance Group performs L'Allegro, il Penseroso ed il Moderato at the Dorothy Chandler Pavilion. Julie Worden is on the cover of a really nice book about the Morris masterpiece. After 17 years of performing L'Allegro, this weekend's performance will be Julie's last. She's hanging up her dance shoes, leaving the Dance Group and heading off into the wild blue yonder. In the arts, there are those who first offer elegance and those who first offer passion. Julie offered passion. Even in a company crowded with wonderful performers, Julie had something to make you notice and say to yourself, "This movement really means something to this dancer." She was great in everything, but owned L'Allegro, Grand Duo, Going Away Party, I Don't Want to Love, and All Fours. I will never forget One Charming Night, where she was the virgin and Morris was the vampire: It was one of the most hair-raising things I ever expect to witness. The past tense is a little premature, for Julie is onstage for a few more more nights and her future will include beautiful movement. But honestly I feel rather elegiac. It is the curse of the dance profession that the fragility of the body prematurely mutes innate artistry. Julie is doing the right thing by leaving at the top of her game. If you see her this weekend she will be unforgettable. Extensive Time Out interview by Gia Kourlas. Hometown interview by Harriet Howard Heithaus. "Drinking with Divas" by Sarah Deming. I don’t think rhythm can be taught. It’s something outside of yourself that you have to just exhale and open into. Overly intellectual artists sometimes have difficulty with this, because there is a striving, a kind of reaching in advance of the beat. But rhythm is about being almost late. It’s about the bottom. Sometimes when the company is most fatigued, that’s when we’re the most together.